The monthly term risk premium is end-of-month T-note yield minus T-bill yield. The monthly credit risk premium is end-of-month Moody’s Baa bond yield minus T-note yield. This definition assumes investors hold corporate bonds as a risky alternative to U.S. Treasuries of comparable duration. The monthly equity risk premium is the end-of-month S&P 500 operating earnings yield (actual 12-month operating earnings from three to six months ago divided by S& P 500 Index level) minus T-note yield. The lag in operating earnings ensures real-time availability of data. This definition assumes investors hold stocks over an extended period (10 years) as a risky alternative to U.S. Treasuries. 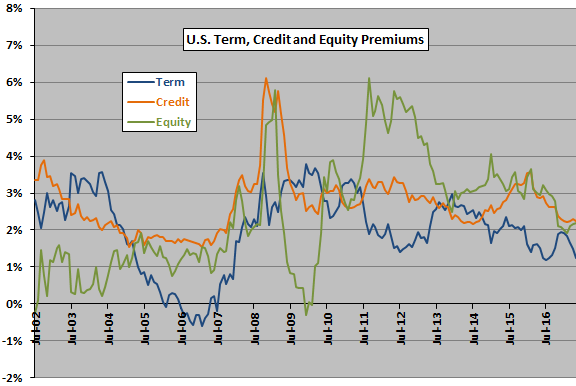 The following chart tracks the term, credit and equity premiums since all asset class ETFs are available. Premiums vary considerably, indicating that competition among the premiums for investor dollars may be complicated. The Best Value strategy each month allocates all funds to the asset corresponding to risk premium with the greatest undervaluation at the end of the preceding month: TLT if the term risk premium is most undervalued; LQD if the credit risk premium is most undervalued; SPY if the equity risk premium is most undervalued; and, Cash if none of the risk premiums are undervalued. Over the available sample period, the best value is TLT during 16 months, LQD during 24 months and SPY during 139 months. There are no months for which none of the three risk premiums are undervalued. The Weighted strategy each month allocates funds to assets corresponding to all undervalued risk premiums by dividing end-of-month undervaluation for each (in standard deviations, as above) by the sum of undervaluations. The following chart summarizes allocations to risk premiums per this strategy over the available test period. While equity risk premium undervaluation frequently dominates, the strategy sometimes allocates large fractions to bond risk premiums (as during 2008-2009). Over the available sample period, the average monthly weights for equity, credit, term and cash are 64%, 20%, 16% and 0%, respectively. How do these two strategies perform? 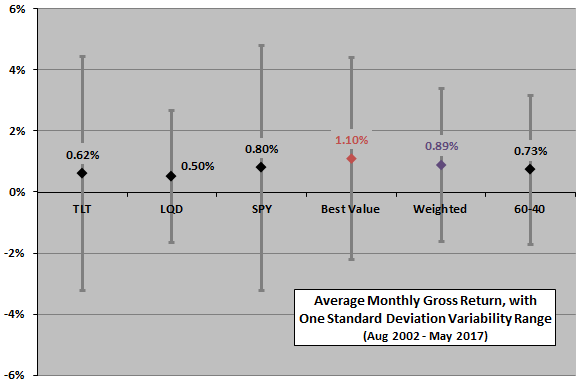 The next chart summarizes average monthly gross returns (no switching frictions) and standard deviations of monthly returns for the ETF components, the Best Value and Weighted relative value strategies and the 60-40 benchmark. 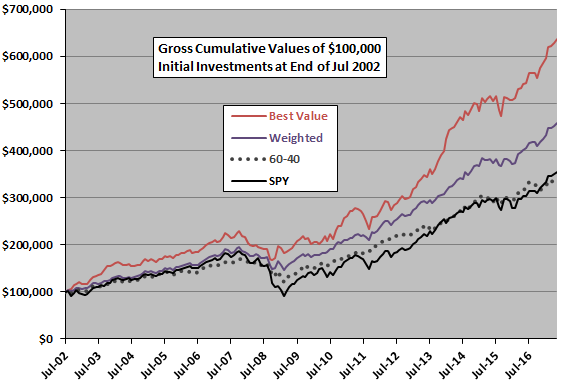 Results show that the relatively strong return of Best Value comes with relatively high volatility. Rough gross monthly Sharpe ratios (average monthly return divided by standard deviation of monthly returns) for Best Value, Weighted and 60-40 are 0.33, 0.35 and 0.30, respectively. How do monthly returns translate into cumulative performance? Reallocate/rebalance at the monthly close (assuming we can accurately estimate end-of-month inputs just before the close). Ignore trading frictions for making position changes. Compound annual growth rates are 13.3%, 10.8% and 8.7% for Best Value, Weighted and 60-40, respectively. Maximum (peak-to-trough) drawdowns are -27%, -25% and -28% for Best Value, Weighted and 60-40, respectively. Rough annual Sharpe ratios (full years 2003 through 2016) are 1.00, 1.26 and 1.09, respectively. The sample period is short for assessment of annual performance. The Best Value strategy switches ETFs only 18 times over the sample period, so trading frictions are low. These infrequent signals suggest that signal execution delays would have little effect. Is the relative value effect consistent over time? The final chart shows Best Value monthly gross returns minus 60-40 monthly gross returns over the available test period, along with a best-fit trend line. 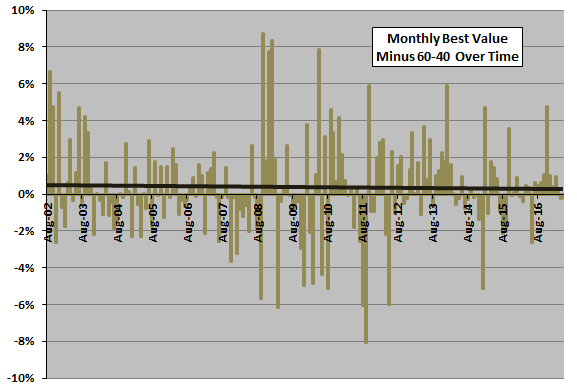 Best Value outperforms 60-40 by an average 0.37% per month, winning 52% of all months. Results suggest slight deterioration in outperformance of Best Value over time, but the test period is not long (especially in terms of number of bull and bear equity markets) and monthly relative returns highly variable. The Weighted strategy outperforms the 60-40 benchmark by an average 0.16% per month, also winning 52% of months. In summary, evidence from a limited sample period suggests that the Simple Asset Class ETF Value Strategy beats a relevant benchmark over the past 14.8 years, but the sample period is short for confident inference. As noted, sample size is modest (about 28 independent annual earnings inputs and just 15 since availability of all ETF components). And, while outperformance of Best Value does spread across many quarters, it derives from few asset class switches and therefore may be sensitive to variations in methodology. As noted, calculations above ignore fund switching/rebalancing frictions. Frictions are lowest for Best Value. The available sample period is largely a secular bond bull market. The strategy may work differently in a rising interest rate environment. Live tracking of this strategy commenced March 2015, with significant modifications to use fresher data at the end of June 2015 and less significant changes to coordinate with the Simple Asset Class ETF Momentum Strategy at the end of April 2017. Other variables may work better or worse for measuring term risk, credit risk and equity risk premium valuations. Brute force experimentation would introduce snooping bias. It is possible that strategy performance is sensitive to the length of the look-back interval used to determine overvaluation/undervaluation of current risk premiums. The available sample is short for testing sensitivity to this parameter. 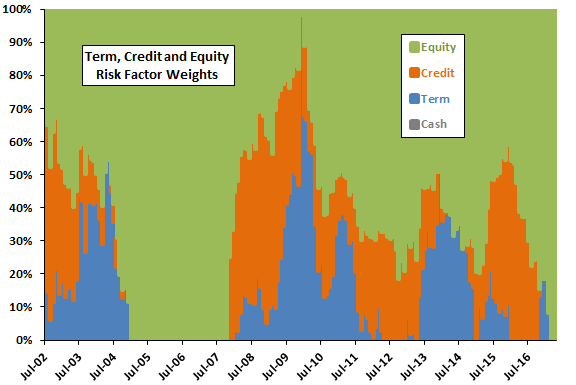 Other ETF vehicles for capturing term risk, credit risk and equity risk premiums may work better or worse. However, length of the available sample period is a concern, as again is the snooping bias associated with experimentation.